AS IT STANDS: Do You Believe In Magic? Since prehistoric times men/women have believed in magic. People still believe in it in the 21st century. People like Texas Congressman, Pete Sessions. He doesn't believe in the science of Global Warming, but show him a good magic trick and he gets downright bubbly! 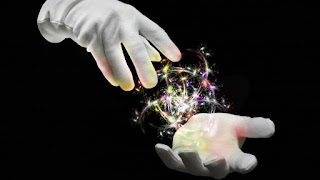 I'll bet you didn't know that the Society of American Magicians has been pushing Congress to recognize magic since the 1960's. The society has found their boy in Sessions. He introduced a House resolution last week that would officially recognize magic as a "rare and valuable art form and national treasure." No. Really. He's tried to pull this rabbit out of the hat in the past with no luck. "Whereas magic is an art form with the unique power and potential to impact the lives of all people; Whereas magic enables people to experience the impossible; Whereas magic is used to inspire and bring wonder and happiness to others; Whereas magic has had a significant impact on other art forms." Rebuilding America's crumbling infrastructure, for example, would be more along the lines of what we should expect from Congress. Of all the thing Congress needs to be doing, celebrating magic doesn't strike me as a top priority. That is, unless some kind of magic can make both parties compromise and actually pass bipartisan bills. In that case sign me up as a believer!